Typically, coincidences are just fun (and sometimes creepy), but I recently experienced one that resulted in PhotographyTalk bringing you the following spectacular series of wildlife images from the Pantanal wetlands in Brazil. During a recent Friday evening, I was watching Ironman 3, while my wife, was surfing on her iPad, as she often does. She then tapped my arm (or maybe it was an elbow to the ribs) and directed my attention from Robert Downey, Jr. and however he was saving the world for a third time, to photographs she found of a Brazilian jaguar attacking a caiman and dragging it through the water to the shore to become the jaguar’s meal. Then, the following Tuesday while on a call with Justin Black, the founder of Visionary Wild, one of PhotographyTalk’s longtime vendor/partners. He wanted to share with me some photos he took during Visionary Wild’s recent Jaguar of the Pantanal II Expedition/Workshop, August 30–September 8. Of course, they were the same sequence of photos my wife had found the previous night online. Coincidence completed! I shouldn’t have been surprised, as Justin and his guest photographers/instructors lead groups of passionate photographers to some of the world’s wildest places throughout the year. In fact, my senior writer had penned an article about the Pantanal trip, which was uploaded to the site during April. Brazil’s Pantanal is the world’s largest continental wetlands and boasts the highest density of jaguars anywhere. For decades, however, naturalists, environmentalists and some of the world’s greatest wildlife photographers spent many hours, days and weeks in frustrating and bewildering searches for the very elusive jaguar. It’s only recently that new methods were introduced, such as “flotels” (floating hotels), that allow not only the professionals, but also amateur photographers to spend all their expedition/workshop time in the Pantanal, on the water, significantly improving the likelihood of seeing and photographing these marvelous cats. 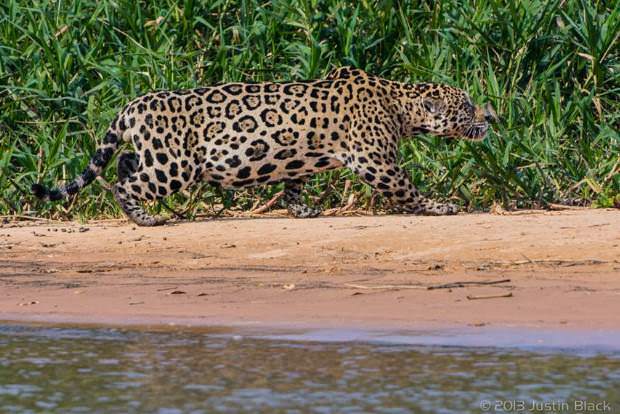 During this Visionary Wild expedition, Justin and Jeff Foott, a famed wildlife photographer and filmmaker and repeated visitor to the Pantanal, learned that a jaguar well known to biologists had been spotted in the area. He had been affectionately (and cleverly named) “Mick Jaguar.” On a bright, sunny day, Justin, Jeff and the workshop participants were on the Cuiaba River, when suddenly there was Mick slinking along the far shore with his attention focused on a caiman sunning himself on the near shore. 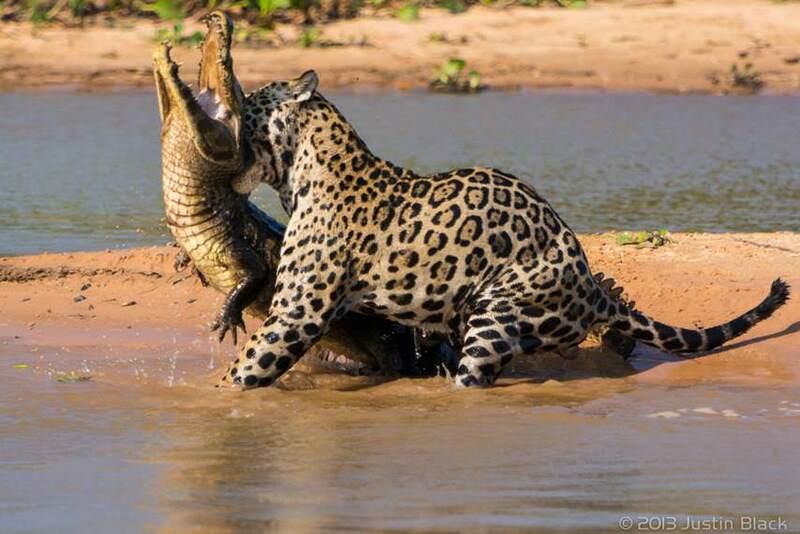 Because they live in a wetlands environment, jaguars are good swimmers; so Mick proceeded to swim the short distance, approaching from behind the caiman, which didn’t seem to notice the cat at all. As revealed in Justin’s amazing series of images, Mick pounced on the 150-pound caiman, struggling at first to grab it behind the neck. 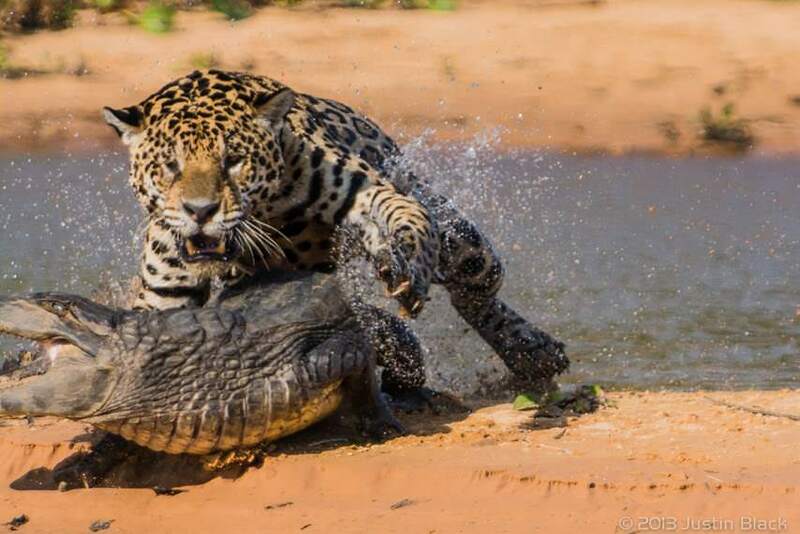 Both animals stumbled into the water, where Mick was able to secure the caiman, drag it to the opposite shore, disappear into the jungle and make a meal of tender caiman meat (Do you think it tastes like chicken to the jaguar?). No doubt, the Visionary Wild workshop participants received a total return on their investment for the Pantanal expedition within those few minutes. Although photographing jaguars may be the highlight of such a trip, the Pantanal is home to an enormous diversity of fauna. These include 80 species of mammals, 650 bird, 50 reptile and 400 fish. Here is where Jabiru stork, heron, ibis and ducks come in huge numbers to breed as well as camera 26 species of parrots, including the hyacinth macaw, the world’s largest parrot. Here is also where the giant anaconda lives, and the world’s largest river otter. 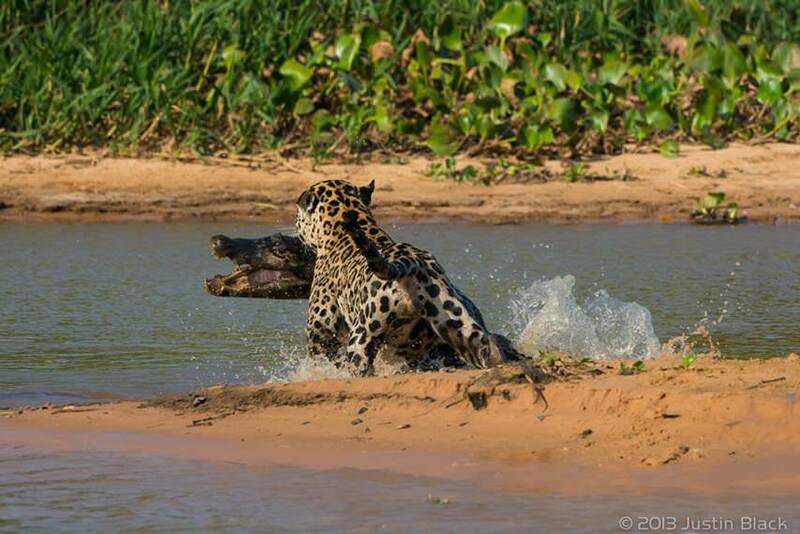 Fortunately, you didn’t miss this once-in-a-lifetime opportunity, as Justin and Jeff will lead 6 photographers into the Brazilian wetlands again during August 2014 for another Jaguars of the Pantanal photography expedition/workshop. Not only will you have this spectacular environment and wildlife to capture, but also expert instruction to make sure you bring home images similar to Justin’s. For complete information and to register, click here. If you’re not the jungle-expedition type or will be unable to join the 2014 workshop group, then you can obtain one of Justin’s images that are available in 2 sizes. He is only offering 14 special, limited-edition prints of the climatic scene when Mick Jaguar grabs the caiman by the neck, so ordering yours today would be a good idea. Click here for all the details.